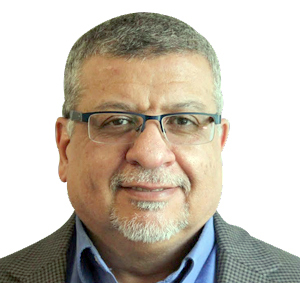 I am very pleased to endorse my TOGAF 9 tutor and instructor Iyad Hindi, and thank him for helping me understand the complex matter of enterprise architecture. He has very deep knowledge in the subject matter, which is backed by practical experience. I definitely recommend him as an instructor and tutor! I worked with Iyad for several years in his capacity as both a Subject Matter Expert and a trainer for TOGAF (Enterprise Architecture). His work for us, his contributions to both our content and our trainer program and his presentations on our behalf have always been of the absolute highest caliber. An experienced software engineer, development manager, enterprise architect and seasoned TOGAF trainer, Iyad is part of the CC&C Americas EA training and Architecture Transformation team. Besides on-site and remote TOGAF and other training, he is a mentor and career road mapping resource for the architect career path. Iyad is a member of the Architecture Forum of The Open Group, and a participant and co-leader in Architecture Forum workgroups that elaborate on current trends on the use of TOGAF in practice. He recently led an 8-month Enterprise Architecture team start-up project using TOGAF for a major oil & gas company. The work focused on establishing EA capability, including installation of IBM Rational System Architect and creation of baseline and target architectures for two IT services in the existing service catalog. Iyad brings deep knowledge of the mobile industry and mobile type approval. He has carried out large mobile phone certification projects for Ericsson and Sonim for GSM/UMTS standards and safety standards of FCC in the US and R&TTE (Radio & Teletype Equipment) in Europe. Iyad earned his BSEE from the Illinois Institute of Technology and has PMP: Project Management Professional and TOGAF 9 certification. This book is the result of a simulation exercise sponsored by SEAS Inc. that examines severe business problems facing a fictitious company. 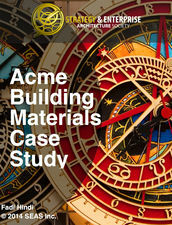 The team that worked on this case study was made up of experts in the areas of Strategy & Innovation, Enterprise Architecture, and People & Change Management.